William Shakespeare (bapteesed 26 Aprile 1564 – 23 Aprile 1616) wis an Inglis makar an playwricht, nou cried the brawest writer in the Inglis leid an the warld's maist kenspeckle dramatist. He is aften cried England's naitional poet an the "Bard o Avon" (or juist "The Bard"). Makkin up his warks is 38 plays, 154 sonnets, twa lang nairative poems, an a puckle ither poems. His plays haes been pitten ower intil ilka great leevin tongue an is played mair nor thir o ony ither playwricht. Shakespeare did maist o his weel-kent wark atween 1590 an 1613. His first plays wis comedies an histories in the main, genres he heised tae the heicht o sopheestication an airtistry by the 1600s. Syne he wrate traigedies up til aboot 1608, makkin plays, like Hamlet, King Lear, an Macbeth, conseedered some o the finest in the Inglis tongue. In his last phase, he wrate tragicomedies an wrocht wi ither playwrichts. Mony o his plays wis setten furth in edeetions o differin quality an accuracy durin his lifetime, an in 1623, twa o his ae time theatrical colleagues set furth the First Folio, a collectit edeetion o his dramatic warks that pit thegither aw but twa o the plays nou recogneesed as Shakespeare's. 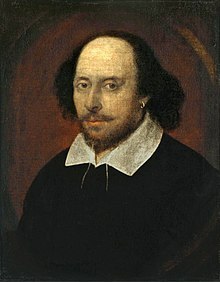 Shakespeare wis a respectit poet an playwricht in his ain time, but his reputation didna rise til its present heichts till the nineteent century. The Romantics, in parteecular, acclaimed Shakespeare's genius, an the Victorians thocht him sic a gey chiel, that George Bernard Shaw cried their reverence, "bardolatry". In the twintiet century, his wark wis taen up an rediscovered bi new muivements in scholarship an performance. His plays is aye unco popular the day an is played time an again an reinterpretit in mony differin cultural an poleetical contexts athort the warld. Wikimedia Commons haes media relatit tae William Shakespeare. This page wis last eeditit on 16 Mey 2018, at 22:52.